Lakeside Daytona Dentist is truly like a family. Dr. Silva and his team will help you every step of the way, from your initial phone call to the minute you walk into our warm and welcoming office. Our team of experts are advocates for the utmost quality of care for our patients. Tasha, alongside our outstanding team members, is passionate about delivering the best customer care for the local Daytona community. We look forward to getting to know you and your family. Please read below to learn more about each special team member. 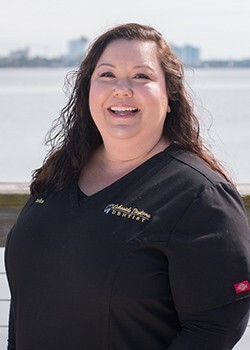 Tasha has been a part of Lakeside Daytona Dentist for two years now, and she has 17 years of dental experience in total. 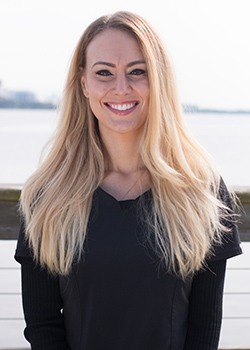 Born and raised in sunny Florida, she attended Daytona State and has also undergone professional training with Breakaway, Heartland, and Levin, as well as insurance courses through dental conventions so that she can stay current on how to maximize patient benefits. 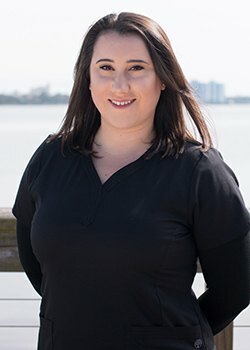 Tasha’s favorite part of her job is being able to watch people come in who have a fear of the dentist and then see them leave saying that they’re not only no longer fearful, but that they actually love coming in! Making people smile is extremely rewarding and it warms her heart to know that she’s made a difference in someone’s life. The team feels like family, and everyone treats the patients like they’re part of the family as well. Tasha has been married to her husband Jeff for 12 years, and they have two daughters named Ashlee (7) and Brandi (17). They have also four of the cutest Yorkies you have ever seen; their names are Axel, Nitro, Finley, and Piper. When she isn’t busy at the office, she enjoys going to the beach, checking out classic cars, going on mini vacations, and hanging out with her dogs. Something interesting about Tasha, she actually filmed an episode for SeaQuest DSV when she was in high school! 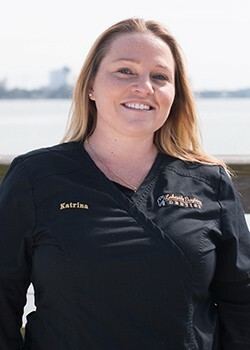 Katrina has been working in dentistry for seven years so far. She received her education from Central Florida Institute and Daytona State. She also has her EFDA in radiology. Her favorite part of this job is being able to make patients smile! Originally from St. Cloud, Katrina’s family consists of her husband, her son, and her step-daughter. In her free time, she enjoys going to the beach, having fun at theme parks, and playing with her kids. Something interesting about Katrina: Besides cleanings, wisdom teeth removal, and ClearCorrect, she has never had any dental procedures. Christina attended Everest University, where she was on the “A” honor roll and served as a student ambassador. Today, she has been a part of the dental field for three years and counting. She is certified in CPR and First Aid and has her EFDA with radiology. She greatly enjoys being able to meet new people and help them improve their smiles. Christina is from Long Island, NY – GO METS! – and she has a fiancé and a son named Aiden. In her free time, she cooks Puerto Rican food, goes to the beach, gardens, and decorates her home. Something interesting about Christina: She took two years of American sign language in high school. 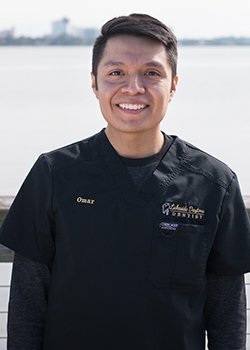 Omar got his start at our practice (and in the dental field as a whole) two years ago. He attended the Hester School of Dental Assisting, as well as Daytona State College. He is certified in CPR and radiology and has his EFDA certificate. He gets to meet people from all over the world through his job! Omar hails from Pierson, and his family is very caring, funny, and supportive. Outside of work, he enjoys photography, trying new foods, going to movies, and enjoying all types of music (except country). Something interesting about Omar: He is bilingual, speaking both English and Spanish. He is also currently pursuing a degree as a computer programmer. Originally from Sanford, Lindsay received her education at Seminole State and Anthem College. 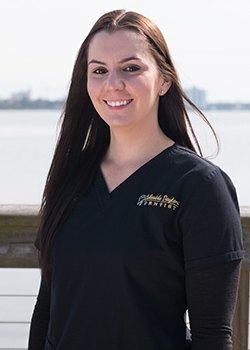 She first started in dentistry four years ago and came to Lakeside Daytona Dentist two years ago. She has her EFDA with X-ray certification, as well as an Associates of Science in Automotive Technology on General Motors vehicles. There’s nothing she loves more about the work she does than seeing patients happy about their smiles. Lindsay will be getting married in March to her fiancé John. They have two daughters named Alyssa (14) and Olivia (almost 1). Her hobbies include working on cars with John, painting, and watching Law and Order SVU. Something interesting about Lindsay: She loves Law and Order so much that she actually named her daughter Olivia Mariska after the actress/character on the show! Mariska Hargitay plays Olivia Benson on the show, so she just combined the two first names. Kelly has been working in the dental field for seven years and counting. She attended Tallahassee Community College and has her hygiene license, as well as certifications in radiology and CPR. She really enjoys helping patients with their oral hygiene and helping them get their mouth healthy and clean! Kelly is from Palm Coast, and she is very close with her family, most of whom live here in Florida. She has two long haired Chihuahuas, Molly and Milo, who she is always excited to spend time with. Her other hobbies include going to the movies, running, doing yoga, and hanging out with loved ones. Something interesting about Kelly: She likes doing paddleboard yoga in the summer and even once traveled to Bali for a yoga retreat.